Keep the Swagman Workmate on the job every day and get the spraying done in less than half the time of pump sprayers. It is compact and easy to handle. The 12ltr Swagman has been built for tradies: construction, concrete form work, property maintenance, carpet cleaning, pest control and more. The 12ltr Swagman Workmates have many of the features of the 16ltr Master sprayers and are built to be just as robust as their bigger brothers with all stainless steel fittings and lance and the 3 filter system. 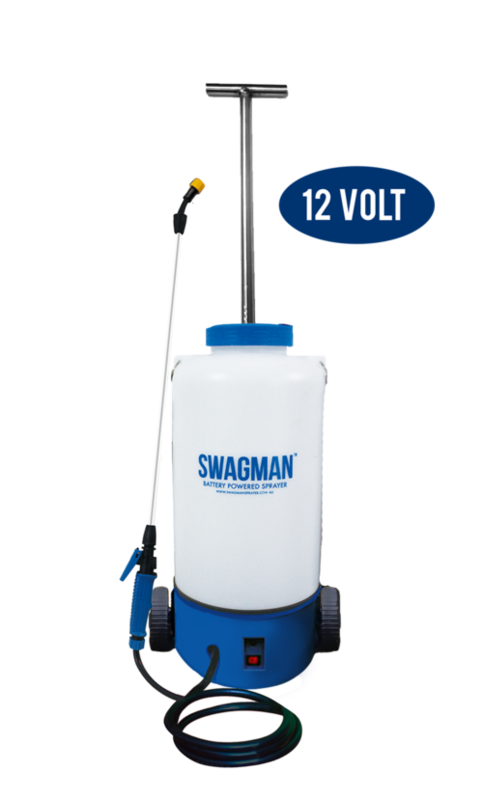 The 12ltr 12volt Swagman Workmate is powered by a fully enclosed and sealed rechargeable 12volt 4AH lithium battery. The pump is a compact mini diaphragm 12volt unit, light weight but with high pressure 70PSI 4 Bar. The result is a robust unit that will spray continuously for 1.5 hours on a single charge. The Swagman maintains constant uniform spray patterns. Select continuous spraying or stop/start control. The Workmate comes with an adjustable Spotter Gun which allows spot spraying up to 10 metres, a dripless fan nozzle and a 4-hole adjustable nozzle. The Swagman’s triple screening of the liquid prior to the pump prevents solids entering the pump unit causing clogging. The filters are easily removed for service and cleaning. The fill opening is extra-large for easy filling and cleaning. See our Buyer’s Guide for quick overview of our Swagman range. Please read carefully to help you get optimum performance from your sprayer. Attention Sticker will remind you of key operational tips. Place it on your sprayer. Return Warranty Card for optimum support. Spotter gun Adjustable spray, spotting to misting. Tank body: High impact moulded UV resistant HDPE (High Density Polyethylene). Large filling and cleaning aperture.